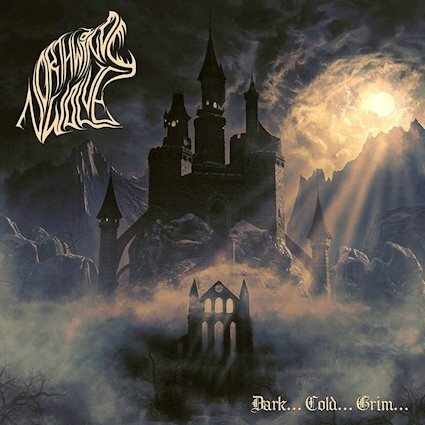 The album opens with the intro of a gust of wind as a sound effect on the track ‘Dark Skies For Black Sorcery.’ The music on this opening track clearly grasps the atmosphere of the album cover with a dark and doom-like sound. Nevertheless, this track does not immediately bind the listener. The further musical course sounds much the same, and the grunts and screams do not bring any variation there. The piano outro, however, is surprising. The second track does know how to arouse this curiosity. ‘Specters in the Funeral Mist’ is an excellent track. The band knows how to combine the keyboard sound well with a nice guitar solo. The song ‘Cold-Hearted Kings or The Occult’ does know many symphonic influences as evidenced by the combination of common instruments such as piano and violin. Still, the track still has little to offer because the screams don’t add anything good to the track. At ‘Last Light Before The Frozen Darkness’ attention is weakening. There are frequently some sound effects such as nature sounds and a roaring smile as an intro, but these sound effects come across as a gimmick, which is a bit irritating. The piano sound in the background also sounds very monotonous. The track hasn’t got a clear beginning and it also ends abruptly. It is only at ‘Entrance To The Dark Universe’ the band regains the attention. The solid guitar work has a nice tempo, and this time the vocals are clearly alternated. With a combination of an organ, guitar, and piano outro, the band manages to finish this track nicely. The band knows how to keep the attention on the next track ‘Majestic Fog On The Everlasting Mountain’, because the track has the same structure as its predecessor. Alas, at ‘Chamber of The Shadow Land’ the attention is weakening again. The band knows how to build in an interesting keyboard sound as a bridge, but because the track ends abruptly, this causes a disappointment again. Can the last track still make up for it? Unfortunately not. The closing ‘Celestial Extinction’ sounds very boring, predictable and ends abruptly. “Bang, boom!” “Pack up, and get the train quickly,” it seems.